Murrayfield Racers emerged with their heads held high after a tough weekend double-header against Kirkcaldy Kestrels and Dundee Comets. 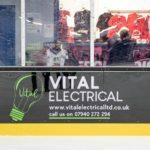 The Racers travelled to Fife Ice Arena on Saturday aiming to maintain their 100% record in the Scottish National League. Goals by Ross Borwick and Aaron Robertson got the visitors off to a perfect start, but Caly Robertson halved the deficit just before the end of the first period. The Kestrels pushed for the equaliser during the middle session, but had to wait until the final period when Conor Duncan made it 2-2. Neither side could find a winner during the final seven minutes, leaving each to take a point apiece and preserve their respective unbeaten league records. 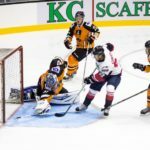 Tony Hand’s side went on to fight out a thrilling 5-5 draw with Dundee Comets in the group stages of the Stuart Robertson Cup at Murrayfield Ice Rink on Sunday. Richard Hartmann (3), Ethan Reid and Joel Gautschi got the goals for the Racers to keep their hopes alive of qualifying for the final. 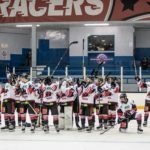 Victories over Kirkcaldy (H) and Dundee Tigers (A) in their final two games with guarantee the Racers top spot in the eastern group. Murrayfield are back in action this weekend with two fixtures on home ice. They face Hull Pirates in the NIHL North Cup on Saturday, before meeting the Comets in the SNL the following day.